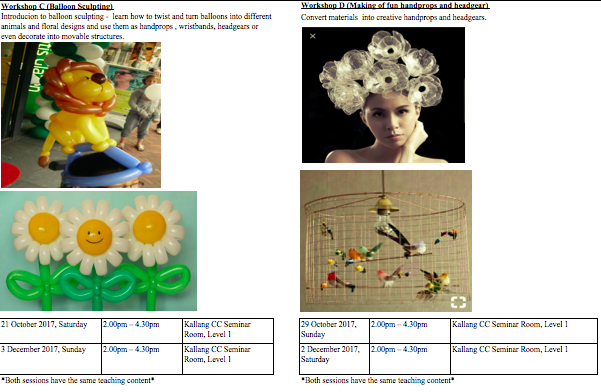 In order to inspire everyone to craft something creative, the Chingay Organising Committee will be holding a series of fun workshops. Conducted by Community Trainers, inspirational ideas, suitable materials and DIY tips & tricks will be shared at the workshops. You will get to hands on and create the various taught items. - Workshop is free of charge but registration is required. - Workshop materials and refreshments will be provided by the Organiser. - The Organiser reserve the rights to cancel or postpone the workshop(s) if they do not meet the minimum criteria number of participants or any reasons. 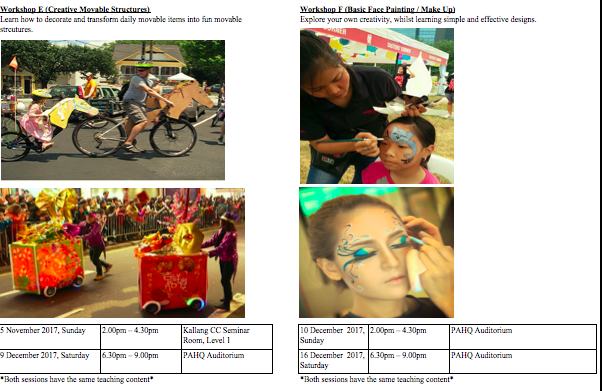 Kindly choose the most preferred workshop (Workshop A- F) and you may also choose to attend more than 1 workshop. Registrations are open for MMS members only until Sunday 8th Oct 2017.